The people at The Garrison must have thought I was really enjoying myself at supper tonight. I was, after all, smiling and giggling like a good un all through my meal. “ during the early part of World War II, the German war machine bombarded Britain with “Teach Your Self German” pamphlets. This part of the war became known as The Berlitz” For the second time in two days, I snorted liquid through my nostrils. A great shame that the rest of the meal could not live up to it. I was pondering on where to have supper tonight when a new “special someone” suggested I meet them for a drink near London Bridge before they had to head off homeward. A bit of net searchage later, I came across The Garrison. 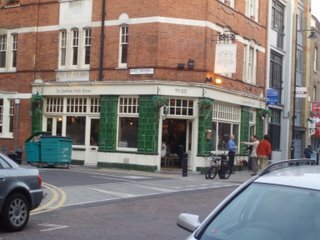 A gastropub on The Bermondsey Rd that seems to be a hit with the good denizens of SE1. After waving my chum off, I headed down to the pub which was full of bright young things and was shown to a table for two in the middle of the room. The menu is very standard GP shtick and there were the pre-requisite specials chalked on a blackboard. Some blah bread was brought out while I looked at the menu. I tasted a bit, not worth the effort. 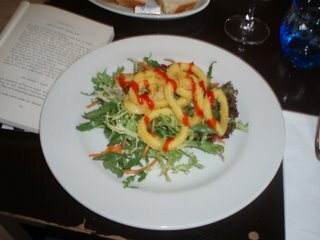 To begin, I chose a special of crispy fried squid with a chilli jam. How bad can a dish get? Look at the picture, my friend, look at the picture. This was a few slivers of crappy squid that looked like it came from Iceland ( the freezer store where they sell complete meals for a £5 not the country just in case there was any mistake ) on top of a mound of leaves from a “ready to eat” bag drowned in too sharp a dressing. This is as bad as food gets without being declared unfit for human consumption. Truly, truly horrid. I almost cancelled my main course, but was half way through an innocuous glass of vigionier, so stayed put. I had misread the menu and thought I had ordered steak & chips. I had not. The dinner menu was actually steak and new potatoes with red onions and beef gravy. The beef was actually not so bad. A decent chunk of Charolais cooked medium rare and with a good ribbon of fat through the centre. However, everything else about the dish was a misfire. The potatoes were nondescript, the onions undercooked and the gravy akin to Bisto. A saving grace was a very good Sauce Bernaise. Sharp with enough vinegar and thick with tarragon. I asked for some Dijon mustard and got some Coleman’s French mustard. It is that kind of place. A glass of insipid Malbec at £6 barely limped out of the glass before I got the bill and limped out of there. I know a lot of people who criticise gastropubs claiming that food and pubs should never mix. I am not one of them. 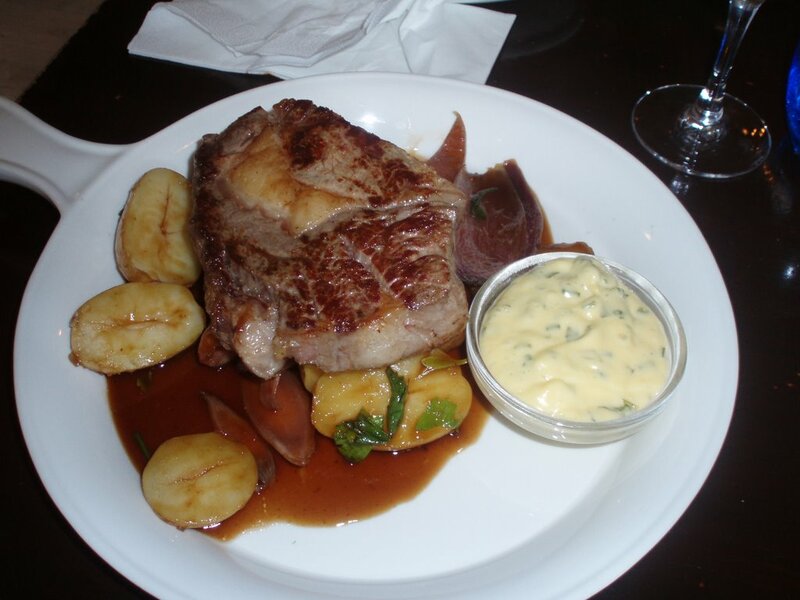 I think the ability to get a decent, simple meal at a reasonable price without necessarily booking is a boon to the London dining scene. But, we have come a long, long way since the opening of The Eagle where people queued to go "ooh" at the thought of a simple, well prepared meal. 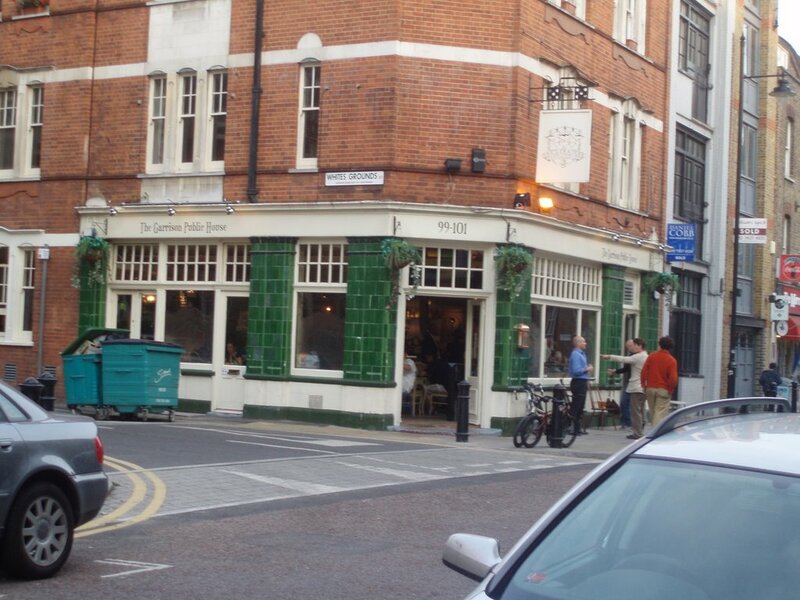 There is more choice in London now and expectations have been raised by places like The Fox and the much missed Sutton Arms. The Garrison could have passed muster ten years ago, but now?